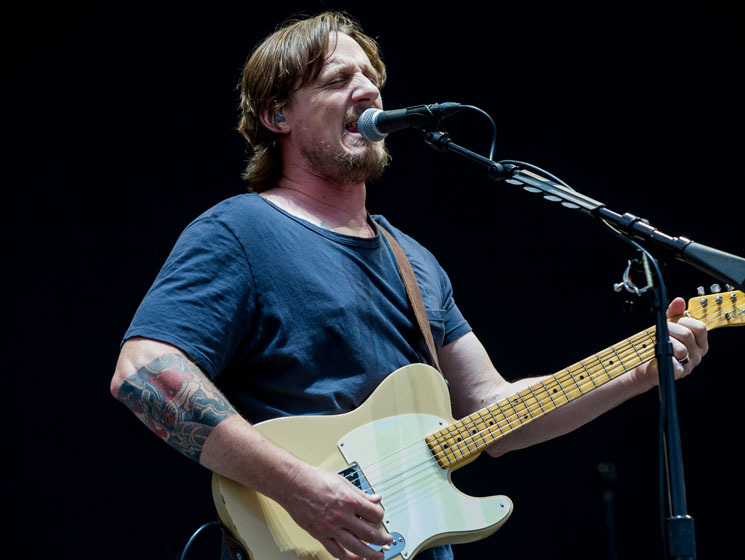 Sturgill Simpson is a lot of things to many people: a modern day country outlaw, a hard-hitting soul artist, a cosmic warrior, a father. But on the final Friday night of this year's Ottawa Bluesfest, he was a badass guitar hero, as his three-piece backing band helped him riff through lean-and-mean renditions of songs from across his accolade-heavy back catalogue. His most recent album, 2016's perfect A Sailor's Guide to Earth, was a mega crossover hit for the Kentucky-bred singer-songwriter, thanks to its stunning songs and ornate instrumentation, courtesy of the Dap-Kings and other session musicians. None of that gilded glitz and glamour apparently made it on his most recent tour's checklist, with Simpson and his band — Chuck Bartels on bass, Miles Miller on drums and Bobby Emmett on the keys — opting for a more stripped-down setup and solo-heavy arrangements. The result is a newfound sense of urgency to some of his softer, more contemplative songs ("Turtles All the Way Down," "Welcome to Earth (Pollywog)"), with the foursome jettisoning the subtlety of his most accessible songs in favour of chugging riffs, meticulous shredding, and relentless power. "I'm too cheap for a guitar tech," he said from the stage at one point, apologizing for a short delay between two songs, in one of his few asides of the evening. In the case of Simpson, sometimes less is more.